So here’s a fun little exercise. I took the election results from the 2009 and 2010 local executive races and plugged them into the 73 legislative districts. The blue camp wins 39 seats, and the green camp wins 34. For reference, in 2008 the blue camp won 60 of these districts. In this exercise, the green camp picks up 21 new districts (relative to 2008) without losing any. 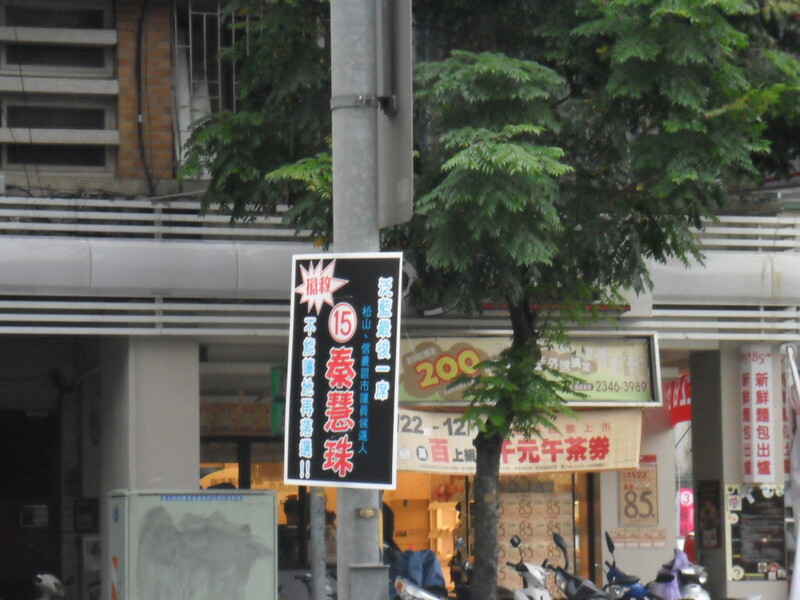 Of course, we have had several by-elections since the 2008 general election, and the green camp has won several unlikely seats, such as Taoyuan 3 and Hsinchu County. In this exercise, the green camp loses three of these seats (those two plus Taidong). 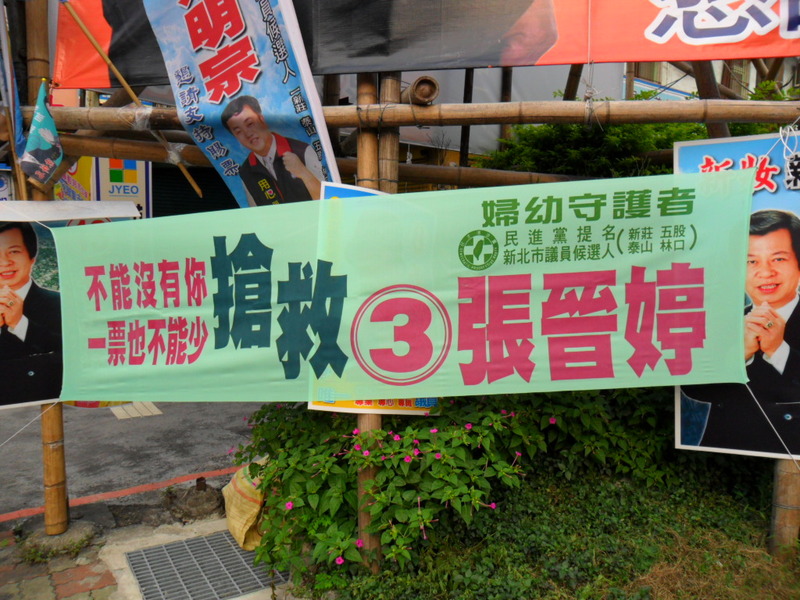 The blue camp also wins back Miaoli 1, which is currently held by an independent who has some ties with the green camp. This does not represent an upper limit for the green camp. In this exercise, it loses several seats by narrow margins. 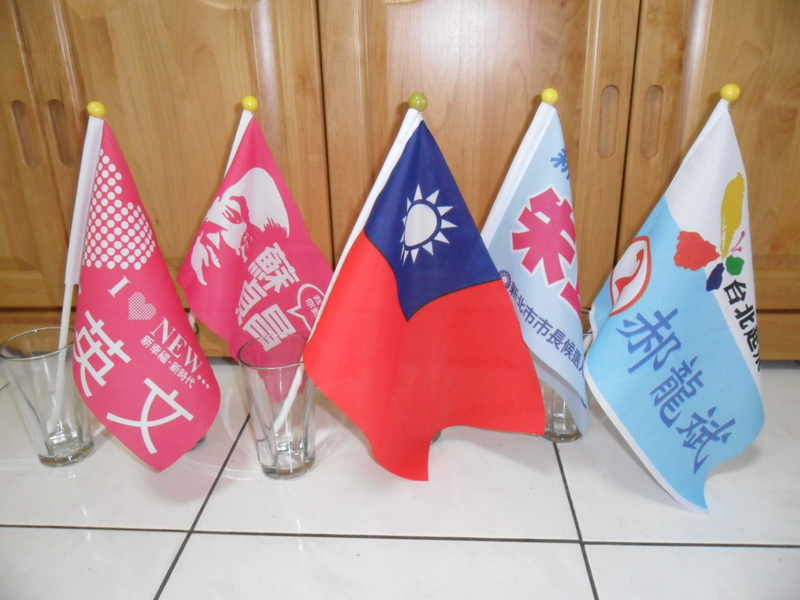 Some of these include Taipei County 7, Taipei County 10, Taoyuan 4, Taichung City 3, Taichung County 2, and Penghu. 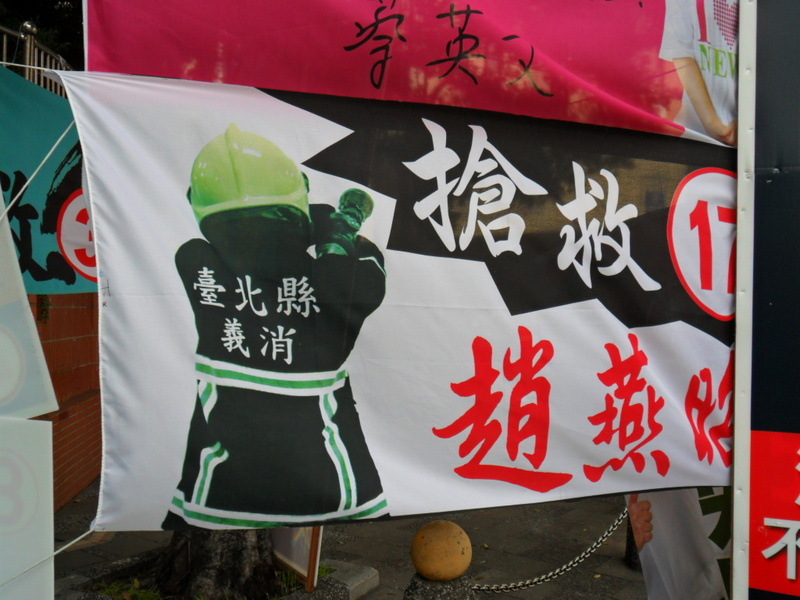 Chiayi City is also a strong candidate to go green in the next election. The four Changhua seats look a bit precarious to me; the same phenomenon that has affected Yunlin, Chiayi, and seems to be slowly transforming Taichung could also be operating in Changhua. However, the DPP doesn’t appear to have any candidates strong enough to match the KMT incumbents there. Of course, there are a few seats that this exercise gives to the DPP that I am skeptical of. 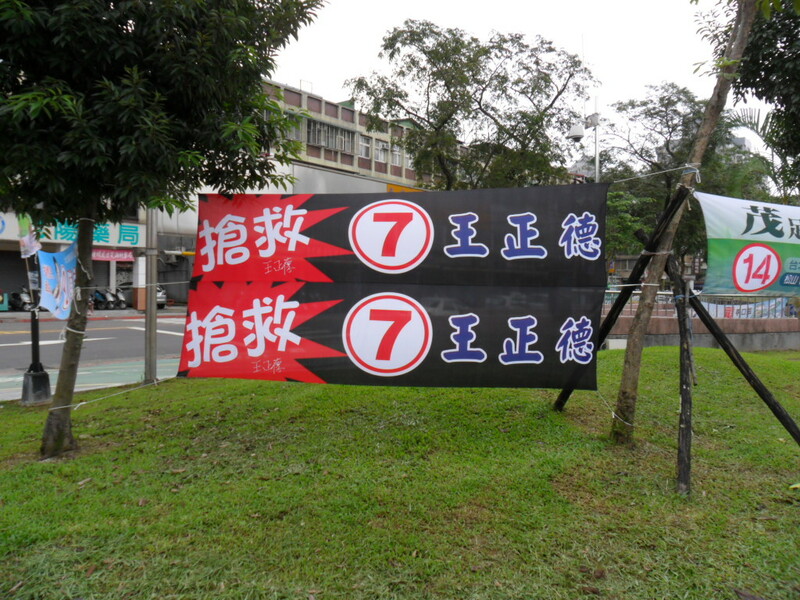 I don’t think the DPP will sweep all eight Kaohsiung seats. (Note: Chen Chu got an outright majority in six of the eight. She was close enough to a majority in the other two that I awarded them to the green camp. In the closest race (Kaohsiung City 1), you would have to assume that over 90% of Yang’s votes came from the blue camp to throw that seat to the blue camp.) 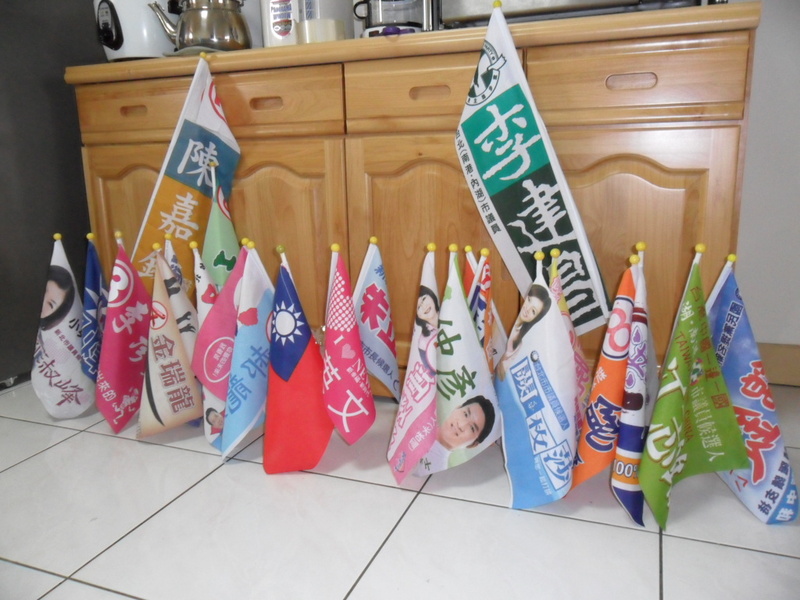 The green camp also wins several seats by razor thin margins, including Taipei County 6, Taoyuan 1, Taichung County 1, and Taichung County 3, as well as a few others by merely close margins. Now, I know that you can’t just plug mayoral numbers into legislative races. There are different issues, a different national swing, and different candidates. This last point deserves highlighting: the KMT has an overwhelming advantage in incumbency. However, I’m not convinced that incumbency is quite as overwhelming an advantage as many people believe. In American politics, many people see very high re-election rates and conclude that incumbency confers an overwhelming advantage. How else could incumbents win so many districts in which their national party is so unpopular? It must be all that constituency service and pork. I’m not so sure. I think that American legislators are also very successful because they can position themselves as “a different kind of Democrat.” American politics has enough dimensions that you can be against gay rights, for gun rights, and against abortion and still be a good Democrat if you are against the war in Iraq, against tax cuts, and for health care. In other words, legislators can adjust their ideological packaging to fit their district. In Taiwan, this is not so easy because there is only one big political cleavage. Attending funerals will only get you so far if voters think you consistently disagree with them on the big picture. Moreover, plugging executive races into representative districts is not as unreasonable as it used to be. For years, there was a big spread between executive races and representative races. The DPP might do 10-15% better in the former. This was mostly because of the multimember district electoral system, which allowed local factions to avoid conflicts in representative elections. The system also played into the KMT’s advantage in personal networks. However, the new legislative electoral system has single seat districts, so these races, like executive races, are largely one-on-one contests. I’m not suggesting that we should expect exactly this result if the legislative elections were held tomorrow. However, I imagine that those election results would look more like the table below than like the 2008 results. The point of all this is that control of the legislature will be at stake in the next election. There is a real possibility that the DPP could win a majority. There is a very large group of seats that flip to the DPP right around the point that the DPP gets 50% nationally. 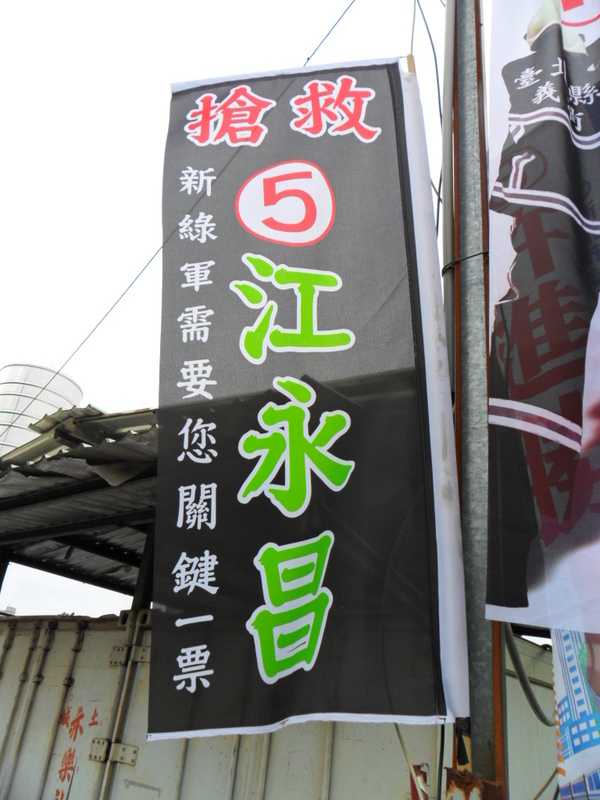 Many people assume that because the KMT has several “cheap” seats (six aboriginal seats, Jinmen, Lianjiang), that the DPP would have to win the national vote by something like 55-60% to win the legislature. In fact, 51% would probably be enough. Unlike in 2000 or 2004, if the DPP wins the presidency in 2012, it might also win the legislature. I’m going to take a first stab at some of the election results today. There are lots of things I want to look at in the data, and I almost certainly won’t be done probing this stuff two or three years from now. At this stage, I’m just looking at some of the most obvious questions and easiest to produce descriptive statistics. The following will all deal with city council election results. 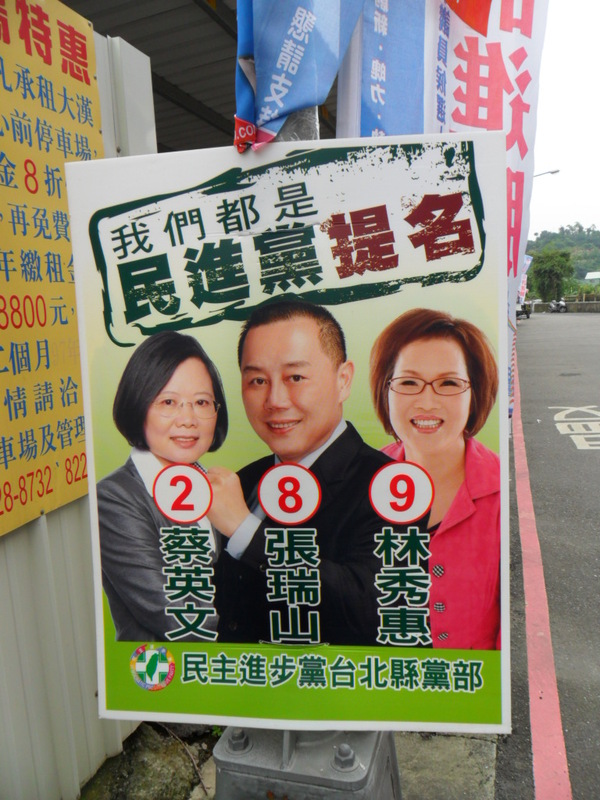 Remember, the KMT got more total votes in these elections than the DPP, by a margin of 38.6 to 35.3. 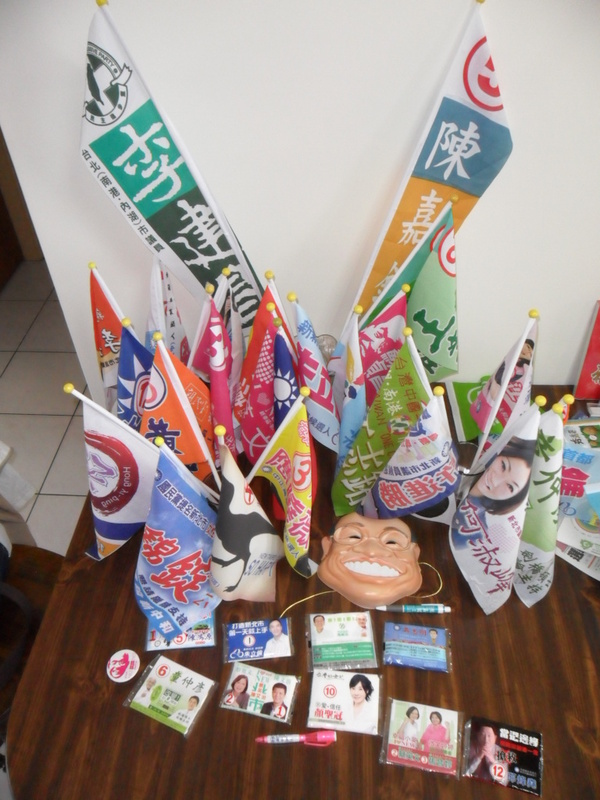 However, there were a lot more KMT candidates, and a lot more KMT losers. Let’s look at the two big parties in the five cities. 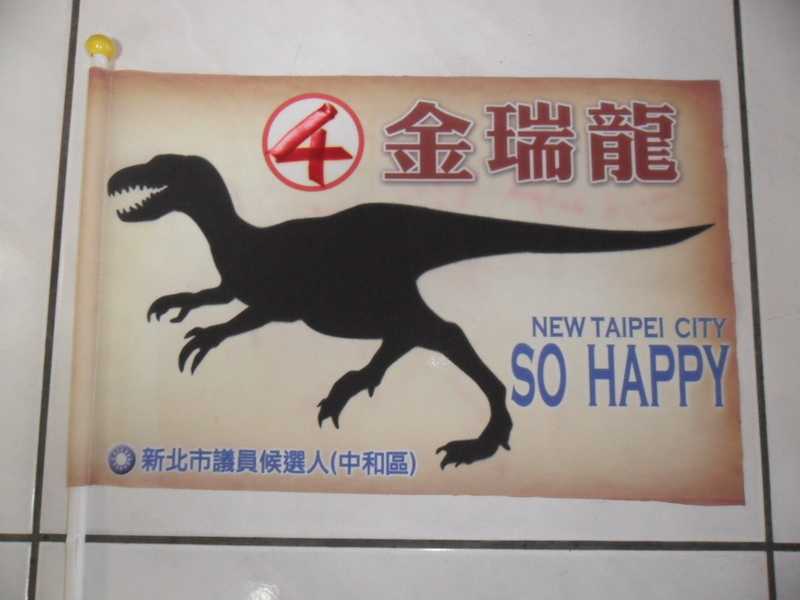 Taipei was markedly different from everywhere else. In Taipei City, the KMT had a fantastic day, losing only two races. Everywhere else, the KMT was bloodied. 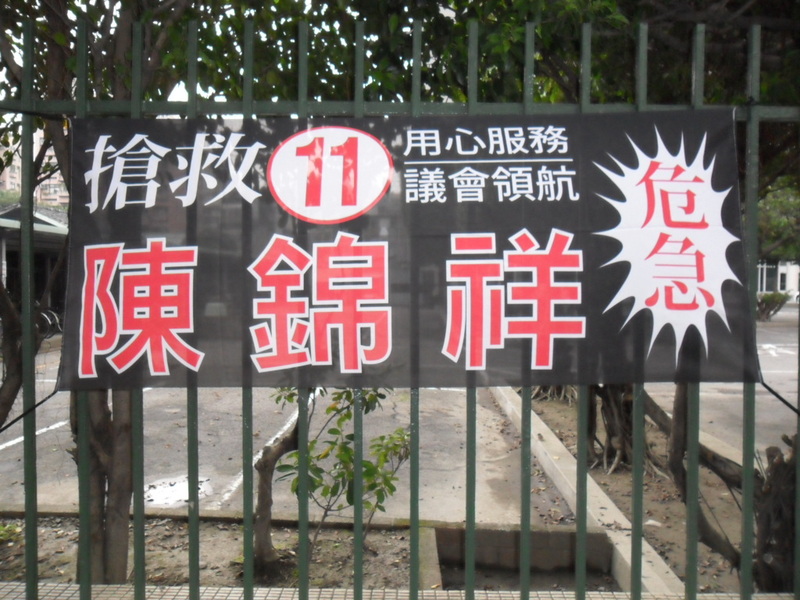 The worst was in Tainan, where nearly 2/3 of their nominees lost. Ouch. The DPP’s performance was much more even across cities. They did a bit worse in Taipei City, but the differences in DPP winning percentages were much smaller. Remember that, compared to past years, there were more seats available in Taipei, the same number in Xinbei, and far fewer in Taichung, Tainan, and Kaohsiung. This meant that all those KMT incumbents in the latter three cities were chasing only a few seats. This was less of a problem for the DPP since it had fewer incumbents and a growing share of the overall vote. With so many incumbents and so few total seats, the KMT almost had to overnominate. As a result, they had fewer votes for each candidate. Given these margins, it doesn’t look like the DPP’s superior performance was due to better vote rationing (though I’ll certainly look into that eventually). Rather, it comes from better nominating. Better nominating could mean two things. 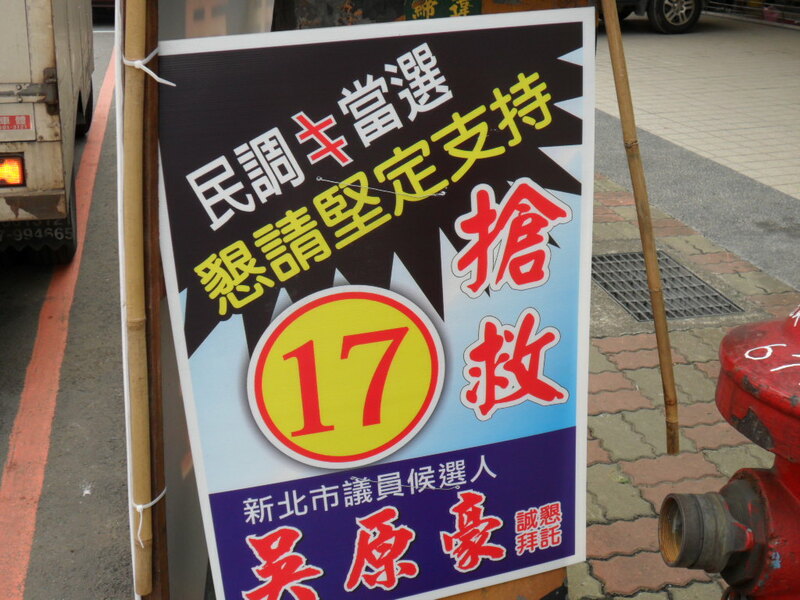 It could mean that the KMT judged correctly the number of votes it would get but couldn’t persuade its members to nominate an appropriately low number of candidates. It could also mean that the KMT thought it would get more vote, and it nominated appropriately for a higher vote share. I’ll have to look into that. It is interesting to look at the numbers of candidates and votes in each city. Remember that Taipei, Taichung, and Kaohsiung are roughly the same size. They should have roughly the same number of candidates and the same average number of votes per candidate. The numbers should be a bit lower in Tainan and a bit higher in Xinbei. Instead, the averages in Taichung are extremely low. 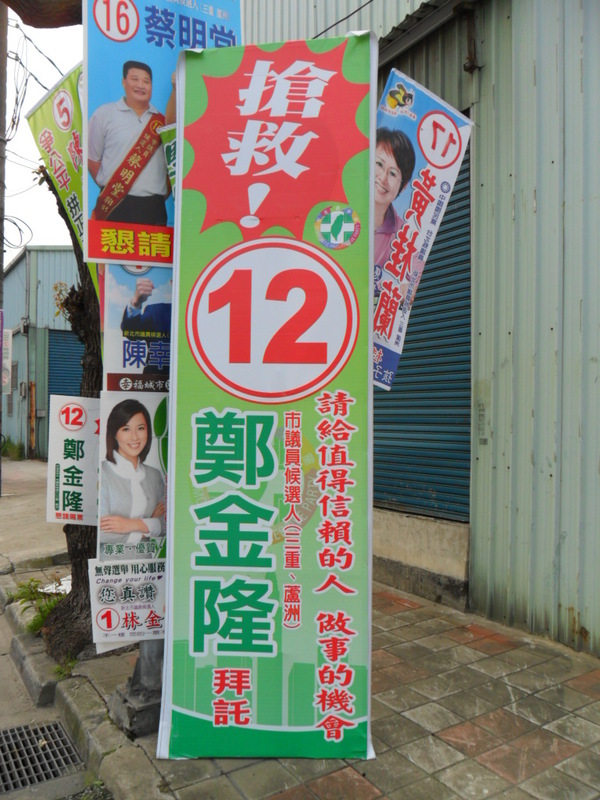 Taichung had lots and lots of incumbents running as independents. 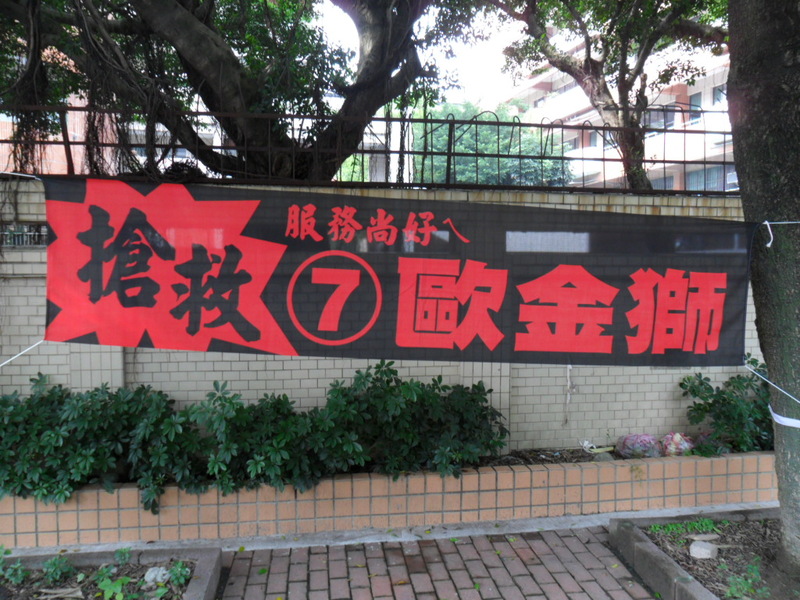 The numbers are extremely high in Taipei, which has very few significant independents and more seats than incumbents. As you can see, very few of the people who lost in the primary but ran anyway were able to win their races. They did get significant numbers of votes, which suggests that they had some appeal beyond the party label. In fact, 7000 votes was usually sufficient to win prior to this year. However, this has to be considered a victory for party discipline. The biggest reason for the DPP’s good performance this year is perhaps the one-time effect of switching systems. The KMT was hit especially hard, as it had too many incumbents. Independents had a miserable day. There were lots of independents who could mobilize 6000 votes. However, it is hard to expand your personal network from 6000 to 12000. Party votes are much more fungible. Next time all those independents will be gone, and the elections will be even more of a competition between political parties. 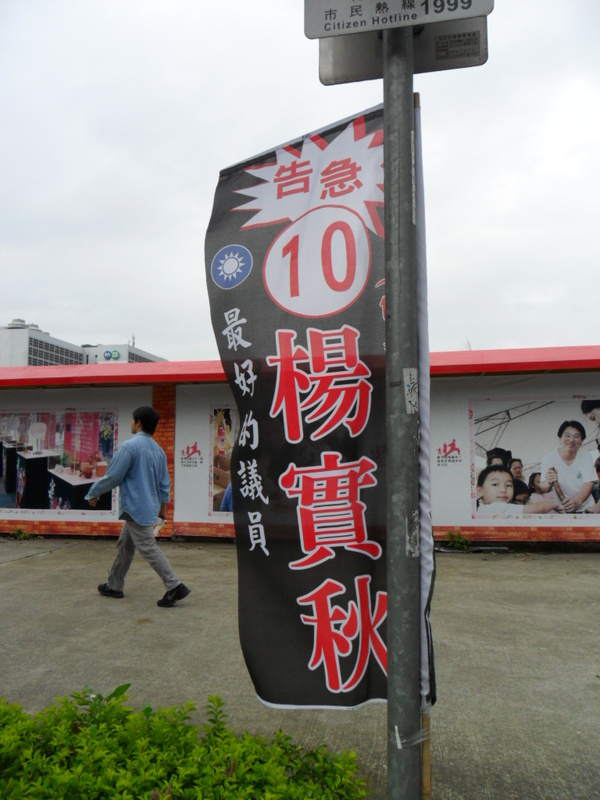 The DPP has announced its vote rationing scheme in Taichung 10. It is asking voters to pair up and have one person vote for each of its nominees. The DPP has two nominees running for three seats. One nominee, Huang Guoshu 黃國書, is an incumbent and quite popular. He won the party primary with an overwhelming majority and played a major role in publicizing the gangland shootings earlier this year. The other candidate is Jiang Zhengji 江正吉, who looks far less popular. Jiang served several terms in the city council in the 1980s and 1990s, but he lost the last two elections. Jiang used to be in the KMT but then became an independent in the late 1990s, ran as the TSU candidate last time, and joined the DPP for this election. 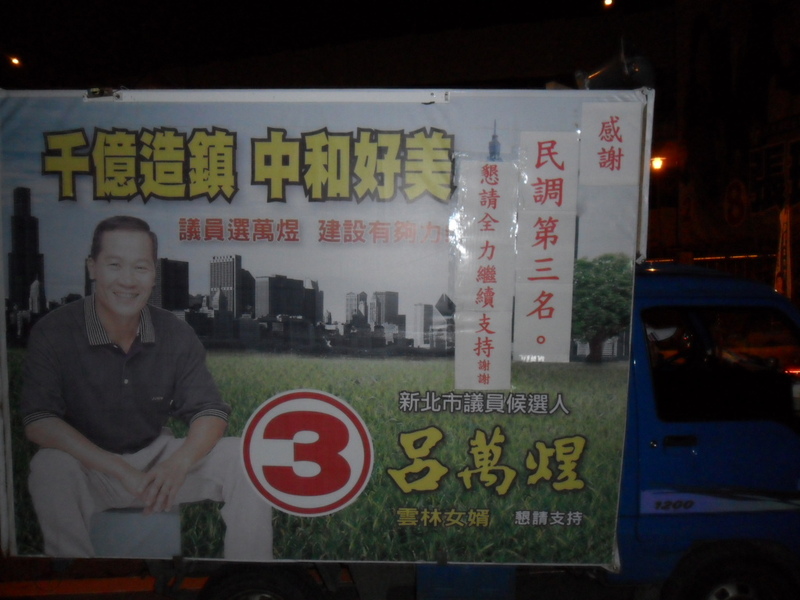 So DPP voters might also have doubts about just how dedicated he is to the green cause. In short, you have one very strong nominee and one very weak nominee. From a strategic standpoint, Jiang would love to split all the DPP votes evenly. Huang probably isn’t so sure about this. If there are enough votes to go around, it’s fine. However, every candidate’s first priority is his own victory. The welfare of the overall party is always second. Are there enough votes to go around for both DPP candidates? Last time, the DPP plus TSU got 42.8% in this district. In this wider election environment, that should either hold steady or go up this time. 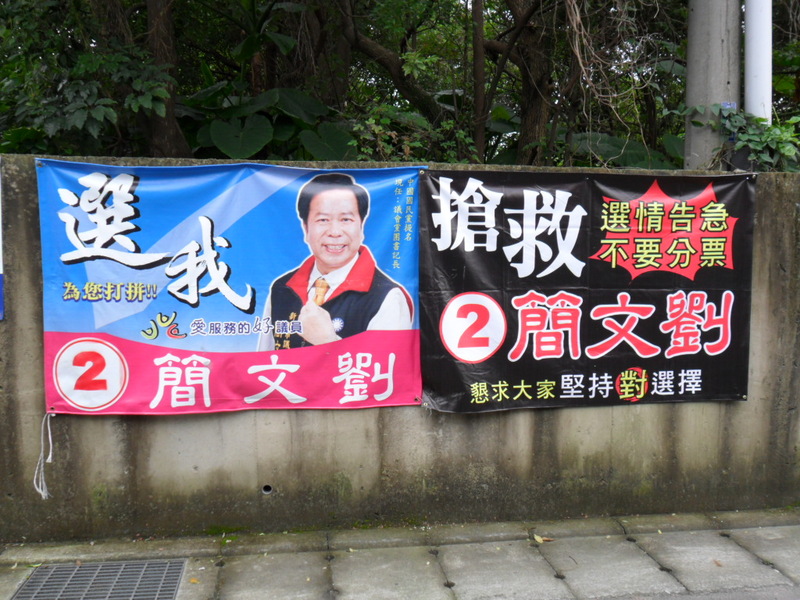 The KMT has two candidates, plus there is at least one strong independent. (Wang Yunlin’s 王允伶 mother is longtime incumbent Jiang Nai-hui 莊乃慧.) So that means that three blue candidates will be splitting the rest of the pie. Moreover, one of the KMT candidates, Zhang Hongnian 張宏年, is expected to be particularly strong. Zhang is currently the speaker, and he wants to be speaker in the new city council. One step in this is sometimes running up a high vote total to give yourself an image of high popularity. So if the DPP splits its votes evenly, it looks like it might be hard for the blue camp to produce two candidates who get more votes unless either Wang or Hong Jiahong 洪嘉鴻, the other KMT nominee, get almost no votes. However, it looks to me like Huang is still hedging his bets a little. This particular vote rationing scheme is a little soft. Rather than giving each voter a definitive set of instructions (eg: all men vote for Huang, all women vote for Jiang), this scheme gives voters a little leeway. You can vote in pairs, but what if you don’t have a convenient person to pair with? What if your family has three people? This scheme makes it just a little easier for voters to rationalize voting for the candidate they prefer rather than splitting their votes evenly among the party nominees. Most political agreements reflect carefully negotiated bargains. Having a vote rationing scheme, any scheme, is better for Jiang than no scheme at all. However, this might have been the worst scheme for him. Still, it might be enough for him to win the third and last seat. One of the most interesting things about the SNTV (single non-transferable vote) electoral system is the way it creates strange incentives for strategic voting. A voter engages in strategic voting when she votes for a candidate other than her most favored candidate in order to get a better outcome. 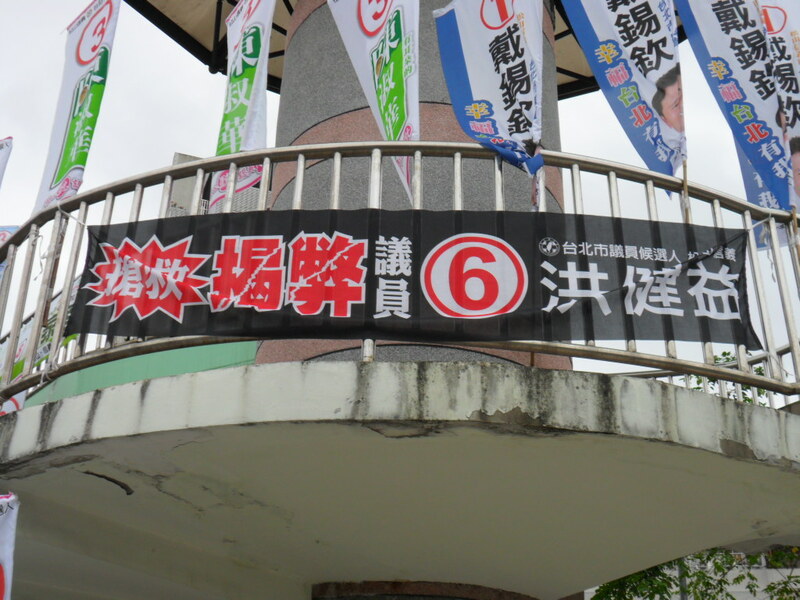 For example, in the Kaohsiung mayoral race, many KMT supporters will likely not vote for their favorite candidate (presumably Huang), but will instead vote for their second favorite candidate (Yang) in order to decrease the likelihood of a victory by their least preferred candidate (Chen). In single seat races, strategic voting diverts votes away from weak candidates to the top two candidates. However, in the SNTV system used in the city council elections, strategic voting can siphon away votes from the strongest candidates. Suppose there are ten seats, and the first place winner wins 25000 votes while the tenth place winner only wins 15000 votes. The first place winner has 10000 extra votes that she could have done without. If another candidate from her party lost by 3000 votes, the supporters of the first place candidate might not be terribly happy, even though their favorite candidate won. For them, a better result would have been for the first place winner to get only 21000 votes, and for the loser to get an extra 4000 votes and thus become a winner. Voters try to anticipate this sort of result by guessing which candidates will get too many votes, and then they divert support to candidates from the same party they think will be weaker. In Taiwan, this is often called “the curse of first place.” No one wants the media to suggest that they are in first place, because their votes might evaporate. The best place thing is to be perceived as being (though not necessarily actually be) on the edge of victory and defeat, because voters give candidates in that position extra votes (to the degree that voters agree on who occupies these positions.) Candidates know this, and so everyone tries to convince voters that they are in danger of losing. This weekend, I drove around Greater Taipei taking pictures of flags. As the campaign draws to a close, candidates often put up flags screaming for help. In this post, I’m going to show a bunch of these flags. Here’ s another one from Zheng Jinlong (DPP, Xinbei 2). He has put the qiang jiu characters in bright red. 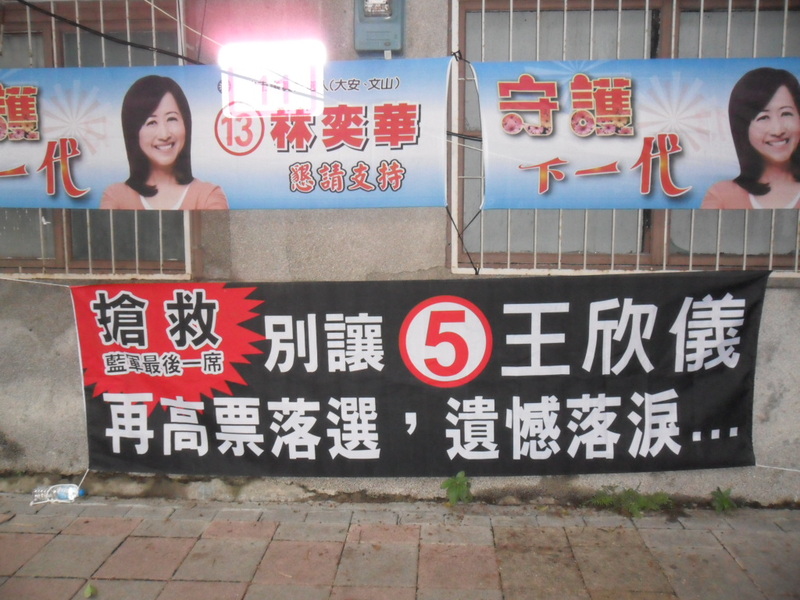 Here’s a fence with banners from three different candidates in Banqiao (Xinbei 4), all of whom are screaming for help. The three are Xiao Guanyu (TSU) in the red and yellow, Wang Shuhui (DPP) in black and red, and Huang Junzhe (DPP) in green. Sometimes you have to do more than just scream for help. Zhao Yanzhao (KMT, Xinbei 4) is emphasizing his ties with the Taipei County volunteer firemen. Presumably they save lots of peoples’ lives, and now it is time for them and their supporters to save Zhao’s career. Black and red seems to have become the official color scheme of the cry for help. This is a bit disorienting for me. Back in the 1980s, black was a color with a very serious political message. The only people who used black in their campaign flags were people who were victims of political prosecution. I suppose it is a good thing that Taiwan is far enough removed from those days that black can now be used to indicate a very different and much less serious type of disaster. Here is a black and red call for help from Jiang Zhiming (DPP, Taipei 2). 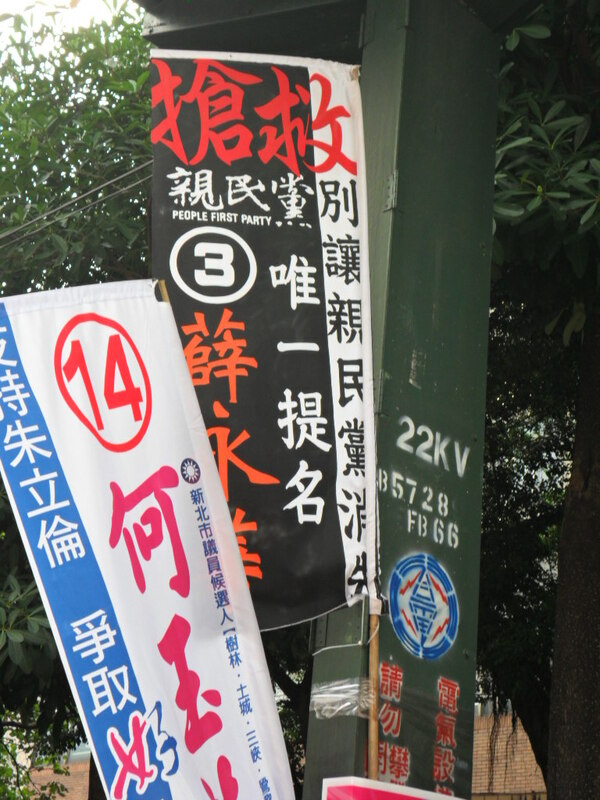 For some reason, Taipei 3 (Songshan, Xinyi) seems to the epicenter of the black and red cries for help. This is Wang Zhengde (KMT, Taipei 3). Xu Jiabei (DPP, Taipei 3). Come to think of it, her father is a former city councilor who has a court case hanging over him. However, she isn’t using black in the old sense; this black and red color scheme is clearly just another cry for strategic voting. Yang Shiqiu (KMT, Taipei 3). 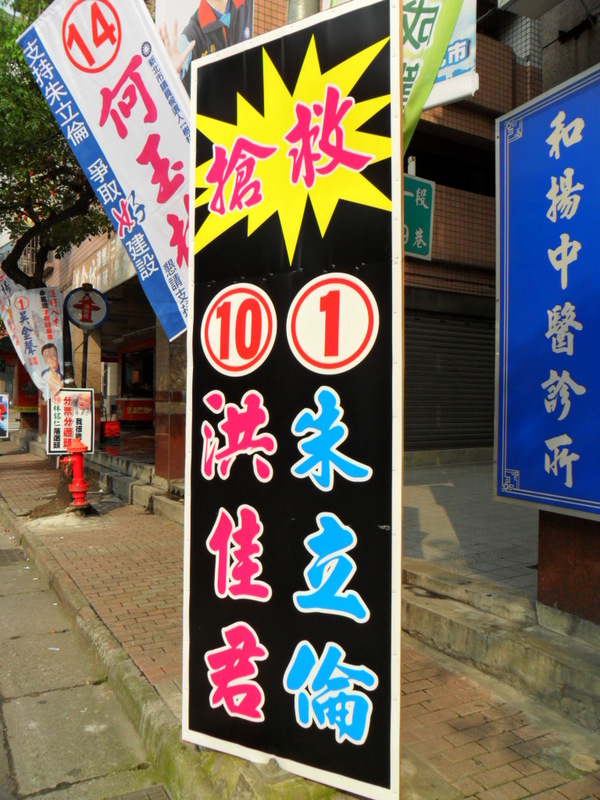 Instead of “qiang jiu” 強救, Yang has substituted “gao ji” 告急, or emergency! Hong Jianyi (DPP, Taipei 3). It’s not just that district. 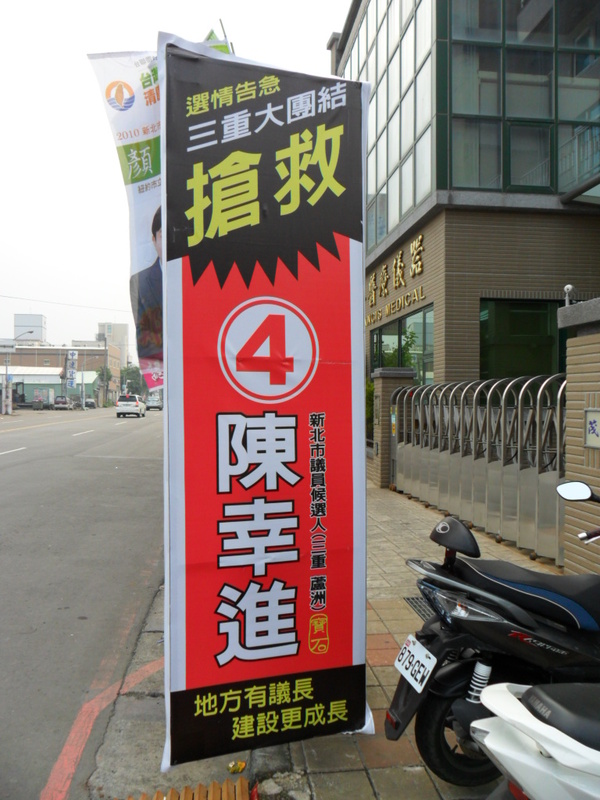 Here is a black and red help sign in Tucheng. (Ou Jinshi, DPP, Xinbei 7). 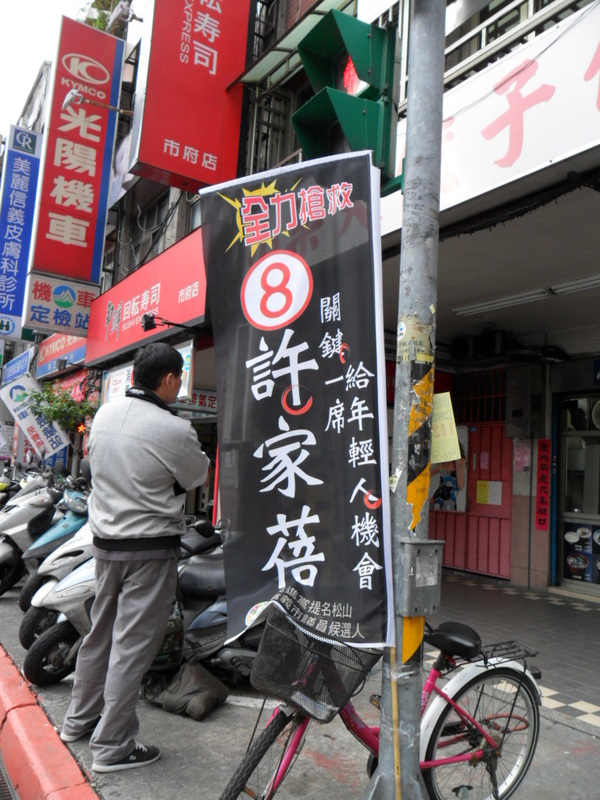 Jian Wenliu (KMT, Xinbei 5) asks people not to split up their votes. 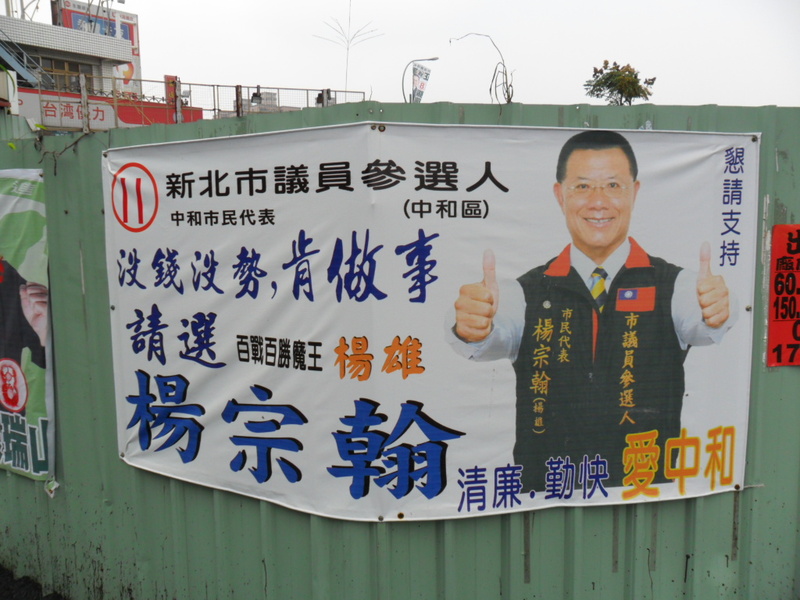 That is, he is asking families to give him all of their votes rather than giving one to each of the KMT’s candidates. Everyone screams for help, not just those who we might think are weak. 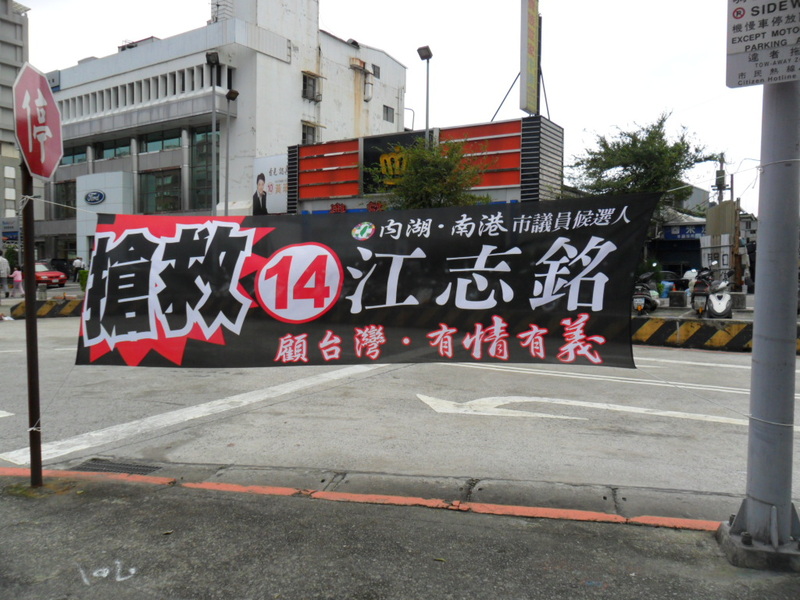 This banner is for Chen Jinxiang (KMT, Taipei 6) who is the vice-speaker of the Taipei City Council. Really? The vice-speaker is in trouble? Really? I can do better. This sign is for Chen Xingjin (KMT, Xinbei 2). Chen is currently the speaker of the Taipei County Assembly. Just for the record, I didn’t make it to the districts of the Taipei City speaker or the Taipei County vice-speaker, so I don’t know if they were using this kind of tactic too. Here’s another candidate who everyone expects to win. This is former legislators Qin Huizhu (KMT, Taipei 3). We already saw another former legislator using this tactic. 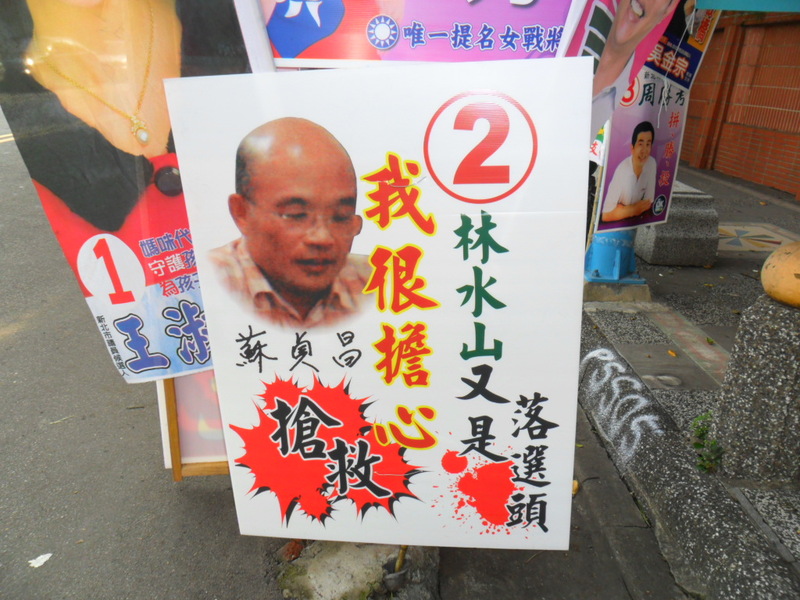 Wang Shuhui (DPP, Xinbei 4) was one of the three people on the wall in Banqiao. Some candidates have figured that voters are probably inured to the save me appeal, and so they try to phrase the appeal in a more convincing way that reflects their special circumstances. Here, Wu Yuanhao (KMT, Xinbei 3) tells voters that survey results are not equal to election results. In other words, he is pleading with his voters not to strategically desert him for someone else. Perhaps no one has played the save me angle as intensely as Zhong Xiaoping (KMT, Taipei 5). Every time I go into his district, I hear a sound truck screaming that he is facing imminent death and needs to be rescued. Zhong has another angle to his appeal. He has lost before, so when he screams that he is in trouble, it might be more credible. He even adds Jason Hu as his celebrity endorser. Here, Tsai Ing-wen tells that Lin Shuishan was the top loser last time and asks everyone to encourage him. Wang Xinyi (KMT, Taipei 6) also lost last time. 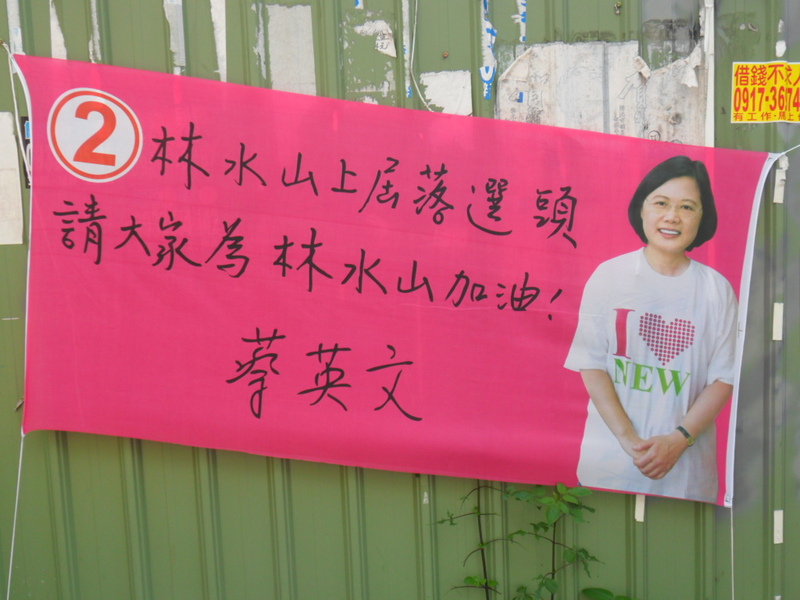 Her banner exhorts voters not to let her lose by only a few votes and cry tears of regret again. The crux of the problem is that all these candidates are trying to divide up votes from the same pool of voters, and each one wants (more than) his fair share. One way to deal with this is to redefine the group of candidates who can legitimately draw from the pool of voters. In Zhonghe (Xinbei 5), the two official DPP nominees (Zhang Ruishan and Lin Xiuhui) pose with Tsai and say “we are all DPP nominees.” To understand why this is controversial, you have to know that a third candidate is trying to make claims on the DPP voters as well. Jiang Yongchang only recently joined the DPP, and since he has been in the party less than a year, he wasn’t eligible to be nominated. 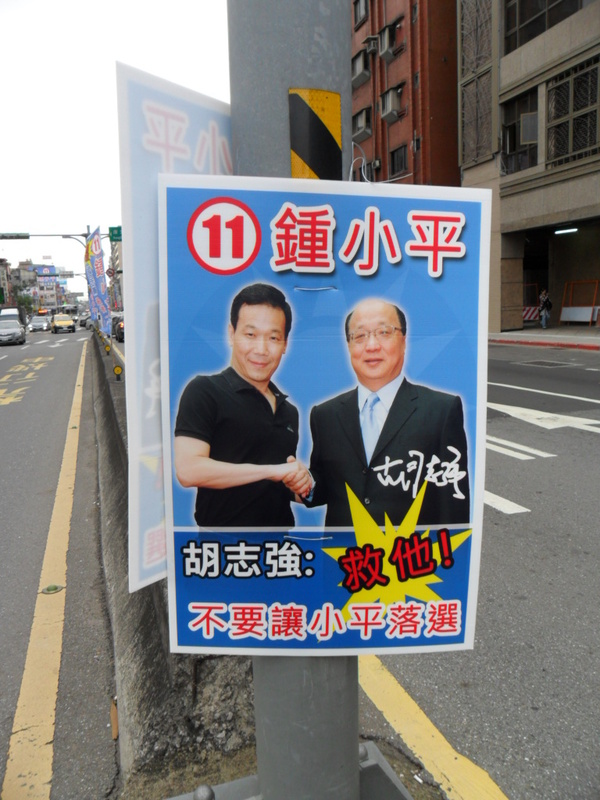 The two DPP candidates are suggesting that Jiang doesn’t deserve any DPP votes. Predictably, Jiang Yongchang (IND, Xinbei 5) screams for voters to save him, as the “new” green soldier needs your critical vote. Usually I think of strategic voting as something that goes on within parties, not between them. However, Xue Yonghua (PFP, Xinbei 7) is the only PFP nominee in his district. He asks voters to save him and adds, don’t let the PFP disappear. In other words, he is trying to convince voters to think about the blue camp, not just the KMT. Finally, we get to the last two candidates, and there is something strange going on. Yang Zonghan (IND, Xinbei 5) boasts that he is a monster, 100 battles and 100 victories. In other words, he is an election juggernaut. In the same district, Lu Wanyu (IND, Xinbei 5) has taped a sign to his sound truck telling people that he is in third place in a recent survey. What? Third place? The district has seven seats. He should be claiming that he is seventh or eighth. What is he doing? And why is Yang telling voters that he always wins? Don’t these guys know how the game works? In fact, Yang and Lu are guarding against the traditional kind of strategic voting, in which voters desert weak candidates to support viable candidates. Both are independents and neither is an incumbent, and the first battle they have to win is to convince voters that they are viable. Party nominees, especially from the two big parties, have a much easier time of this. If they weren’t strong enough to win, they couldn’t have ever gotten a nomination. Independents don’t have this kind of credible signal, so they have to send other signals. It seems you have to convince voters you can win before you start screaming that you are going to lose. On Saturday night, a friend and I went to a rally for Eric Chu in Zhonghe City. We were a bit late because the traffic on the freeway was horribly backed up. He joked that it was probably all the people going to the rally. Of course, that would be ludicrous; no rally has that many people. However, after our normal 30 minute trip took 90 minutes and all the other roads leading away from the rally were completely clear, it became apparent that it really was the rally. I think they were unloading all their busses in the slow lane, so that the slow lane backed up to the freeway exit, which eventually backed up to Xindian. Wow. There were quite a few people at the rally. The site was big enough for 12000-15000, but it wasn’t quite full. There were large gaps of seats that were completely empty, while other blocks were completely full. Well, that’s what happens when most of your crowd is mobilized. Of course, mobilized people are still people, and there were a lot of them. I estimated about 9000, give or take a thousand. (My estimates tend to be a lot lower than most people’s. This is because I count people rather than simply pick a big number out of the air.) It wasn’t a bad crowd. There was a reasonable amount of energy. If the speaker was boring, the crowd wouldn’t pay much attention. However, if the speaker got them involved, the crowd did respond. Some of the speakers included legislators Wu Yu-sheng 吳育昇 and Hung Hsiu-chu 洪秀柱, county executive Chou Hsi-wei 周錫瑋, and party elder Wu Po-hsiung 吳伯雄. After my description of Hung’s speech in the Da-an Park rally (which I did NOT, in fact, call the “garden of hatred”) made such a stir on the internet, I feel obliged to comment on her speech this time. Huang repeated some of her speech about Chen Shui-bian, who she still refused to call by name. She still said that they had felt dissatisfied 悶 while waiting for a court ruling on Chen’s cases. However, this time she did not use the word “hate.” I repeat, she did not use the word “hate.” Actually, her whole speech had a lot less passion in it this time. Maybe she decided to tone it down, but I think the most important thing is probably simply that another week has gone by. Time moderates most passions. The crowd in Da-an Park didn’t react too strongly, and this crowd had even less reaction. I wouldn’t call it boredom, but perhaps it was mild interest. The best speaker of the night was County Executive Chou Hsi-wei. When they introduced him, he got a very warm reception. You are reading correctly: the guy who was not popular enough to be re-nominated was the star of the night. Chou launched into a passionate speech that really grabbed the crowd. I think he got a little carried away by the moment and went a little overboard. Near the end of his speech, he screamed “Down with the DPP” 打倒民進黨, a line that sounds like it comes from the Cultural Revolution. But the crowd was with him, and he was probably letting off a year of pent up frustration. Neither Chu nor Ma was at their best. Ma inherited a riled-up crowd (from Chou) and proceeded to put them to sleep. It was the KMT’s 116th birthday, and he talked for 5 minutes about the origins of the KMT. He tried to sell us on the idea that the loss of Taiwan to the Japanese was instrumental in Sun Yat-sen’s dissatisfaction with the Qing court. In other words, the KMT’s establishment was closely linked to Taiwan. A) I don’t remember Taiwan being a critical factor in any of the accounts I’ve read, and B) this very dry topic sucked all the energy out of the crowd. The rest of the rally wasn’t very memorable. You are currently browsing the archives for the 2010 city council category.